The World Health Organization (WHO)’s definition of health as a “state of complete physical, mental and social wellbeing, and not only the absence of disease or infirmity,”2 embraces basically the same principles associated with human rights and development, since all three seek to improve both the human condition and the fulfillment of the human potential. In the 1990s the interrelationship between democracy, development, and rights was agreed by consensus in the United Nations (UN). The symmetry of the rights framework was embodied in the proposition that “all human rights are universal, indivisible, interdependent and interrelated” and must be treated “globally and in a fair and equal manner, on the same footing, and with the same emphasis,”3 including the right to comprehensive health care and integral health state. Integral health state can be viewed within this social context as a high complexity function of multiple physical, mental and social ability and wellbeing factors, specific to each individual, family and community, and of general societal and medical factors. Within it, population-based health is the result of the interaction of health factors at each level of human organization with broad factors such as all living standards of development, as well as health care. This includes personnel, infrastructure, scientific base, drugs, technologies and management factors. Different forms of interaction among these factors can improve, preserve or worsen integral health state. In the Moncada Manifesto (1954), Fidel Castro stated that at the time Cuba had extremely low health and other living levels. Its author, in power since 1959, has taken credit for building and upgrading Cuba’s health facilities. Since the Soviet-style system was implemented in Cuba in 1959, the political focus changed from self-sustainable development to exporting of this model to all neighboring nations. In the meantime the former Yugoslavia and later China abandoned this system due to scarce practical efficiency and lack of economic coherence. In 1980, analysts at the U.S. Bureau of the Census detected an unpublicized rise in infant mortality rate (IMR) in 1970–77 in the USSR. The life expectancy at birth (LEB) and of elderly (LEE) had also been falling since 1965, when the USSR had the world’s highest density of physicians per population. This showed that a large number of physicians is not a sufficient condition to preserve health. At about this time, Cuba was reporting an apparent “first health miracle” improving IMR and LEB. The world’s left movement shifted to Cuba to showcase socialist-style universal healthcare “supposedly comprehensive, free, and equal for all with high humanitarian solidarity.” In 1983, Cuba endorsed the Soviet theory of social advances and happiness with slow income growth. In the 1990s, Cuba’s economic collapse, liquidity problems, scarcity of credits, and lack of political will to set free its captive people and adapt its economy to follow world trade rules, consciously reanimated an insane class war, and exacerbated chronic malnutrition, poverty, helplessness, and oppression. This caused the return of old epidemics and the emergence of others, at the population physical and psychosocial health levels. In 1993, new transparency in Russia after the end of the Soviet regime exposed a greater decline in LEB than previously estimated.7 Meanwhile, oppressed and impoverished Cuba reported an apparent “second health miracle,” still lowering IMR and rising LEB thanks to “top political will maximizing health with minimum costs.” Hidden behind these claims were decades of political violence by an oversize government on freedoms, health, education, income per capita, and other living levels of Cubans, justifying most failures by U.S. aggressions and blockades. There has been much research about the contribution of improved living standards on health and vice versa by health income, but relatively little on the effect of long-term worsened living standards on health. The impact of Cuba’s half-century of totalitarian- socialist very slow development on health care and health status has not been studied yet.8 The aims of this study are: to examine the relationships between Cuba’s access to integral health, freedoms, other living standards, development systems, and health achievements in 1902–58 and 1959–2010; to identify the political will to prosper and violence to redistribute integral health, freedoms, and other living standards; to calculate measures of freedom for both periods, reformulate, and calculate a freedomadjusted HDI for four nations; to compare the HDI and its dimensions of democratic and totalitarian Cuba with those of colonial Korea and democratic South Korea. 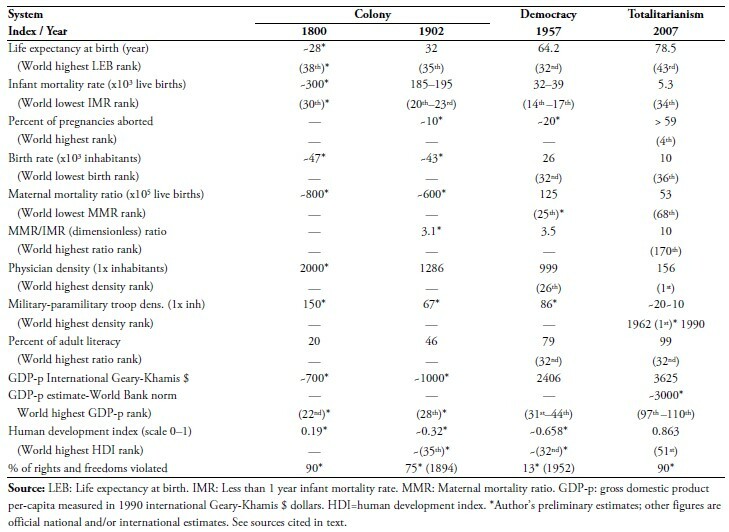 Table 1 shows how democratic Cuba (1902–57) had reached excellent ranking worldwide in mortality reduction: 14th-17th and 25th place in low IMR and maternal mortality ratio (MMR), and 32nd in high LEB. Totalitarianism (1959–2007) worsened Cuba’s performance, rising to 34th place in IMR and 68th in MMR, and to 43rd in LEB. It also stagnated in 36th place with respect to low birth-rate, reached the 4th place in high abortion ratio and an unknown (but very high) place in women sterilization-ratio (both compulsory); Cuba ranked in 170th place, driving down a top MMR/IMR dimensionless ratio from 3.5 to 10. In 1902–57, Cuba occupied 5th place in the Americas and 26th place worldwide regarding physician density per population; 3rd and 16th places regarding dentists; 3rd and 14th places regarding midwives; 5th and 26th regarding pharmacists; and 6th regarding nurses and 3rd regarding hospital beds (public plus private) in the Americas, all devoted to serving the health needs of Cubans. Cuba reached one of the world’s top places regarding physician density per population (2003– present) and also of troops (1962, 1990)—a high percentage rented to perform humanitarian-ideological, and mercenary slave work abroad. Cuba’s GDPp doubled in 1902–57, reaching the 31st-44th places worldwide, while in 1959–2007 it worsened to the 97th-110th places, despite heavy subsidies and failure to pay a large external debt since 1986. Estimated violations of freedoms-rights in 1902–1952 fell from 75% to 13%, with 10 freely-elected presidents. In 1959–2007, violations increased to 90% under a leftwing dictatorship. One of Cuba’s democratic governments (1948–1952) was a promoter and signatory of the UN declaration on universal human rights, while the left-wing dictatorship (1959–2012) did not sign the UN human rights covenants of 1976 until 2008. Since 1990, whereas the IMR and LEB continued very slow improvement, Cuba re-suffered at the physical health level: epidemic optic and peripheral neuritis (not seen since Weyler’s “Reconcentration” during of the Independence War in 1898); epidemic dengue fever (not seen since the 1950s; it returned hemorrhagic in 1977 and it seemed eradicated in 1981); epidemic hemorrhagic conjunctivitis (considered eradicated in the 1970s); and quarantinable cholera outbreaks in 2012 (not seen since 1882). Cuba has also suffered an increase in morbidity of tuberculosis, syphilis, viral hepatitis, leptospirosis, and other infectious and parasitic diseases. In addition, at the psychosocial health level, Cuba has suffered other types of epidemics: hopelessness, despair, definitive emigration by sea, often at the risk of life, and temporal emigration for purportedly humanitarian missions, but really ideological and mercenary in other nations, though these epidemics have been endemic in Cuba since 1959. 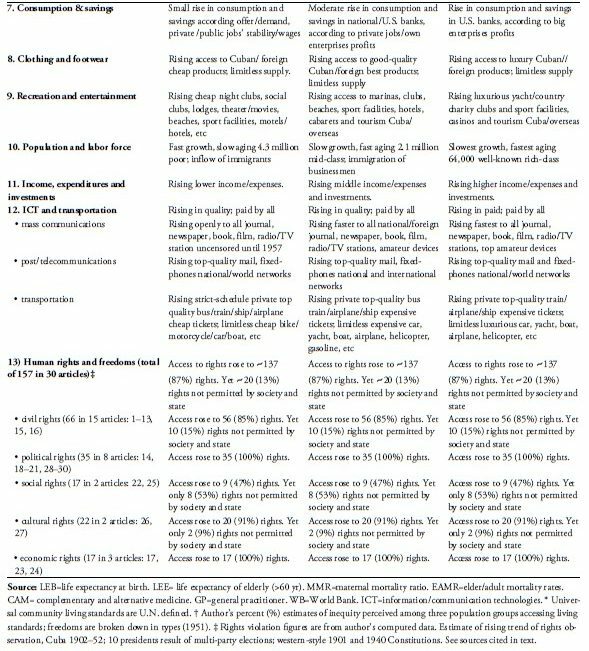 Table 2 shows high and gradual improvements in distribution of access to health and other living levels achieved in 1902–58 for each Cuban population stratum: poor (~66%), middle (~33%), and affluent (~1%). There was a narrowing of differences between strata at both ends, with a growing middle stratum. In 1760, all world nations had a high degree of inequity: ~1% affluent and ~99% extremely poor, with high equity at the bottom. In Cuba, the poor included African slaves, who were freed during 1868–80, Caribbean and Latin American immigrants, and creoles. In 1902–58, the size of Cuba’s extreme poverty layer fell, with many moving to moderate and borderline- levels of poverty as a result of increasing employment and living levels. At the same time, there was also positive movement within the middle stratum from the low to the high layer, which encompassed high-wage workers and those who owned small-medium businesses. The affluent stratum composed of European immigrants and selected creoles was newly populated by entrepreneurs and individuals associated with the top businesses. Cuba’s poor workers gradually gained access to increasing quantity, duration, and quality of integral health—measured indirectly by demographic, morbidity—through growing access to health care and other indexes, with the latest U.S. vaccines, sanitation and therapeutic means increasingly available to them. Prospering through social mobility was the main determinant of the growing access to resources, which encouraged higher productivity and sustainable development. This system resulted in better living standards and little emigration. Rights violations declined from about 75% in the colony to 13% in democratic Cuba. 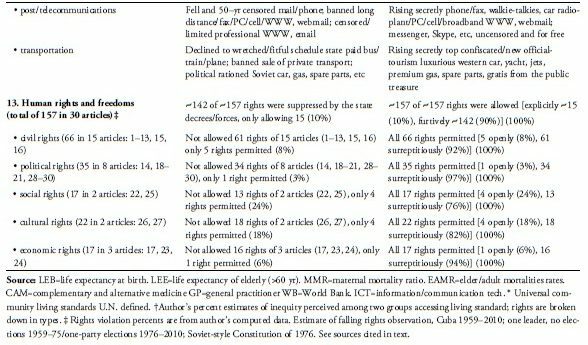 Table 3 shows the sharp redistribution in 1959 of access to integral health and other living standards achieved in democracy for the two Cuban population strata that were prevalent after the revolution: mass (~99%) and leaders (~1%). The previous powerful middle and affluent strata had their freedoms and properties limited and were essentially eliminated and agglutinated with the poor, in a very large and amorphous mass of poorer people. This mass has suffered a half-century of deprivation and of declines of previous living levels they had achieved. Meanwhile the newest affluent totalitarian socialist leaders enjoy high and rising living levels. The social mobility mechanism changed from contributing to Cuba’s integral progress to absolute loyalty to a leader in power, unethically justifying depressing living levels with actions against the regime by the United States. The captive mass gained universal access to a physician—trained in large numbers, with very scarce scientific exchanges abroad—poorly equipped, using WHO vaccines, old and scarce means, due to the elite’s diversion of funds for other purposes. In 1959 Cuban patients lost access to the latest clinical tests, drugs and procedures, except for some women when pregnant and some newborns and infants. In spite of an exclusive 21–month intensive care formula for pregnancies and newborns, the improvement of the IMR, MMR, LEB and LEE indexes has slowed down at the same time that there has been stagnation and rise of elder and adult mortality rates (EAMR), especially in men, whose care is very poor after four years old. The mass has suffered from increased rationing of food and other basic needs: sub-nutrition camouflaged with excess of sugarcane, declining husked rice, and scarce proteins; misinforming and below-par education; overcrowding in unfurnished, run-down housing, endless blackouts and lack of running water; generalized under employment, with a US$0.50 mean daily-wage, unpaid forced overtime; poverty-level pensions of US$0.10 per day; low-quality, secondhand clothes; primitive recreation activities—smoking and drinking rum in streets; young workers emigrating to wherever there is an opportunity to go; expropriation of bank accounts and reduction in the value of the Cuban peso since 1961 from US$1 dollar to US$0.05; misinforming and censored media; cell phones were banned until 2009 (they are extremely costly) and access to the Internet is still banned; scarce and unscheduled subhuman transportation; and state regulated suppression of 90% of human freedoms, particularly political, economic and civil rights. Meanwhile Cuba’s leaders, and their families, have unlimited access to the best clinics, specialists, the latest tests, drugs and procedures, even covertly performed in top U.S. hospitals. They secretly enjoy all the living comforts of the world’s richest people in the “supposed paradise of social justice and equity,” avoiding the eyes and ears of the deprived mass, and buying the silence of Cuban officials and journalists. They secretly recreate luxuriously in isolated keys (banned to the masses) of Cuba’s archipelago and in valuable properties bought abroad. The Gini coefficients underestimate Cuba’s secret income inequality, which could be over 0.95. The leaders enjoy ~157 rights-freedoms at 100%: openly ~15 that are also allowed to the masses plus another ~142 to which the masses have no access. In Box 1, the UNDP HDI is reformulated as a multi-dimensional (tetra-dimensional) measure, adjusting the original HDI to incorporate a measure of freedom. In addition to calculating a freedom-adjusted HDI for Cuba, the same has been done for China, South Korea and the United Kingdom. For Cuba, freedom-adjusted HDI showed a reduction of 24% from the original HDI value (0.863 to 0.653), worsening Cuba’s ranking from 51st place to 131st place, while China showed a reduction of 22% of the HDI, worsening from 92nd to 136th place; South Korea showed a very small reduction of 0.4%, worsening two places; and the UK showed a small increase of 1.4%, improving from 21st to the 12nd position. Table 4 shows that Cuba’s LEB in 1900 doubled to 64 years by 1957, 11 more than South Korea; yet in 2007, it was 78 years, one less than South Korea’s. Cuba’s literacy rate in 1900 was almost doubled to 79% in 1957, about the 5th highest in the developing world, twice South Korea’s; yet in 2007, both were 99%. Cuba’s GDP-p in 1900 was doubled to $2,406 in 1957, twice South Korea’s $1,206; yet in 2007, Cuba’s $3,764 was one-fifth of South Korea’s $19,614. The 1990–2011 HDI reports showed high non-income development for Cuba combined with low and slow growing income. This behavior deserves a comprehensive analysis to understand in depth what has really happened in Cuba. Censored and misinforming official reports and media communication on “health and education achievements” conceal the disintegrated nature of Cuba’s health and education contrary to the WHO and UNESCO definitions, which assume the countries are living in freedom. This is a main cause of most biased healthcare studies of Cuba. While there are some challenges related to the accuracy of the GDP-p’s, the challenges in measuring Cuba’s health and education dimensions are even higher. It is one thing to have universal access to a physician and a teacher in an environment of captivity, poverty, and oppression of most rights and suppression of living levels; and another is to have access to universal coverage of comprehensive healthcare with world standard tests, medicines, and procedures, and to a comprehensive education with world standard information and communication. Unfortunately, the HDI does not capture the fragmented and distorted health and education. Improving the sensitivity of the HDI is the main reason to adjust the HDI for freedoms. McGuire and Frankel in 2004 described integral health achievements in pre-revolutionary Cuba obtained in spite of slow growth rates of GDP-p. They described a healthcare system, institutions and living conditions favoring integral health even when universal access to a physician was not yet achieved in distant rural areas. However, it had universal access to midwives trained in aseptic practices. These authors showed how the revolution, starting from a privileged baseline in health levels, slowed previously improving trends in IMR and LEB, but much more the MMR and EAMR. They noted that the comparatively minor advances during the revolution were in spite of what they interpreted as greater “political will” on a state-run healthcare than on the pre-revolutionary private-mutual-state healthcare. But Mc- Guire and Frankel, as outsiders who never lived in revolutionary Cuba and did not experience the inferior status granted to citizens, were unable to understand that the main force acting was “political violence” instead of will. The revolution suppressed most rights that had been observed until the 1952 Fulgencio Batista coup, and depressed living standards (that had been growing even under the previous autocratic regime during until 1952–58), to levels below those humanly permissible. Since the 1960s, misinterpretations of the lessons of Cuba’s “political will” have proliferated, marked by the participation in healthcare of Soviet-style community paramilitary organizations and the popular power of the communist party, whose first goal is to spy and oppress the masses. Biased statistical contrasts of Cuba with the Philippines and other nations have been frequent. These studies have focused on physical survival indices of infants and pregnant women, ignoring Cuba’s privileged health baseline in 1958 to measure improvement after the revolution. Most of these studies have been blind to the fragmented healthcare policies, inequality in access to integral health, freedoms and living standards, and to the collateral damage due to abandonment of older children, elder and adult mental and social health. A constant has been to blame U.S. policies and the trade embargo for all revolutionary failures, overstating their impact and justifying suppression of freedoms and living levels. These evaluations, supported by 53 years of anti-American propaganda, have obscured a fact: that Cuba’s underdevelopment has been caused by the archaic and oppressive Soviet system. A challenge faced by the UNDP is the lack of complete operationalization of the WHO health and UNESCO education definitions to allow the HDI to integrate long and integral healthy, educated and creative life in freedom, with progress of decent income and living levels. The UNDP does not recommend that nations try to maximize the HDI. But the Cuban Health Ministry in 2007 expressed as a directive the priority to guarantee a LEB of 80 years very soon. This was critical since the revolution faced the structural impossibility of developing decent living levels and GDP-p growth rates based on the Soviet experience. In 1957–70 Cuba suffered a civil war, massive executions, famine and impoverishment due to the confiscation by the government of all lands, industries, businesses, and other properties coupled with other wrong-headed policies. These worsened IMR, LEB, MMR, EAMR, and LEE. In 1960, Cuba launched rural medical services and a compulsory literacy campaign. In 1968 it started a campaign to stop the rising IMR and falling LEB—both also targets of the U.S.-promoted Alliance for Progress. To this day, these indices for 1956–69 are absent in Cuba’s health statistics reports. Over the period 1959–2010 Cuba suffered a setback in living standards greater than suffered by Myanmar, due to Cuba’s higher baseline reached until 1958. Cuba has regressed—by constant political violence—from a succeeding civilization to worse than outdated slavery. Comparing trends of Cuba and Korea’s HDI measures it can be seen how Cuba’s underdevelopment resembles North Korea’s, also with an anachronistic Soviet-style system; meanwhile South Korea, starting from a lower baseline than Cuba in the 1950s, integrally developed under a U.S.-style development model. Cuba, allied with North Korea, fell to the third worst world place regarding rights and freedoms. If Cuba had freezing winters as does North Korea, it would have had in 1992–94 about a halfmillion deaths by a political inflicted famine. Cuba’s HDI is reduced by a quarter when it is adjusted for freedom, falling from 51st place to 131st place; meanwhile, South Korea’s HDI is reduced by 0.4% of HDI worsening from the 26th to the 28th place. South Korea’s rights have greatly improved from non-free to moderately free, though the UNDP deemed it to be a democracy with 40% of violations. The differences between South Korea and Cuba with respect to all of the freedom indexes are vast, with Cuba ranking in one of the world’s last places in these dimensions. The UNDP reported that Cuba had only 60% of rights violations, instead of the 90% estimated here and even higher in other studies, apart from the violations of freedom promoted abroad exporting its oppressive ideology. The UNDP did not classify North Korea, but given its abysmal performance in freedoms (a score near to 0), its freedom- adjusted HDI would be 30% lower than whatever its HDI would be. The UNDP has focused its attention on Gini-style coefficients of income inequality and of other issues but has not considered freedoms. On the basis of studies by this author, if Cuba had not diverged from the democratic path it was following until 1952, it could have developed faster in integral health, education, and maybe in GDP-p, even than South Korea, Hong Kong and Singapore due its close relations with the U.S. Physical health and demographic conditions, beyond the biomedical genetic and environmental view, and above all, the mental and social abilities, wellbeing and health levels, are strongly and directly interrelated with all other living standards, especially freedoms. Over the period 1959–2010, Cuba’s totalitarian- socialist government redistributed access to integral health and other living standards. It first worked violently to limit access to freedoms and then to comprehensive integral healthcare, education, income and other living standards from the relatively high average level reached by the middle class during the democratic period to a low level of a new huge poorer class, all in the name of social equity. The right to an integral health standard cannot be fragmented and disconnected by political violence from other rights and living standards. All of them are positive or negative social determinants of human abilities, wellbeing and health progress or regression. Our results challenge the biomedical growth-centric thinking in public health and support a bio-economic- psychosocial model to better measure non-physical health dimensions. 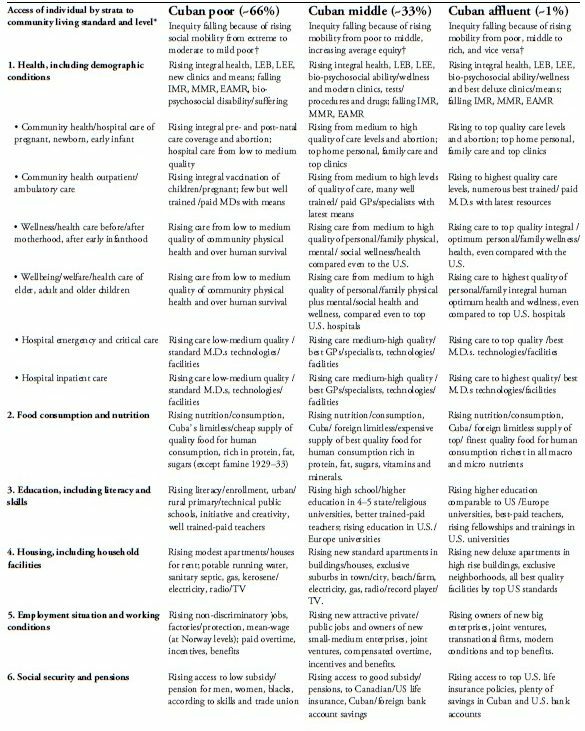 More research to operationalize health in a broader set of indicators to measure integrally its tri-dimensionality, especially the non-physical health ones, is needed. The amazing work done by the UNDP measuring human non-income development is the best example of what the WHO could begin to do. In any society, high living levels are positive factors for progress of the health of individuals, families and communities. Low national living levels mean development delay. Increasing them can make a nation develop; the British in 50 years developed New Zealand and Australia and turned them into modern societies. In some instances, a country’s living standards instead of progressing and benefitting the population may be depressed by a retrograde system that relies on foreign subsidies. This is the case of Cuba. Cuba evolved over 60 years applying the successful Western model, but involuted with the Soviet one, taking advantage from Soviet and more recently from Venezuelan subsidies. Discouraging and weakening the action mechanisms of positive living level factors, converts them into negative risk factors, with depressing effects on previously achieved modern integral living and health levels. This unexplored setback of Cuba’s rights and living levels has partially maintained physical health. Revolutionary Cuba has accentuated the first paradox begun in the republic, slowing improvements in IMR and LEB and GDP-p growth through selective policies. But it also has created a second paradox due to setback also of healthcare (hospitals, clinics, labs, etc) and public health infrastructure (water, sewage, sanitation services, etc.) and average health personnel preparation, allowing the return of physical health epidemics such as cholera even while maintaining progress in bio-pharmaceutical research and industries, and the emergence of psychosocial health epidemics (seen before in the Soviet Union, Germany, Italy and Japan). The main cause of the psychosocial health epidemic is the constant class war. It has generated a spectrum of undiagnosed problems of the human cognitive, motivational and behavioral areas. These have lowered the integral health quantity—not measured yet—and the duration of periods of integral health, and have fragmented and distorted health quality. The problems range from mild to severe acquired and chronic mental and social health stagnation, regression, retardation, alienation, suffering and inability of adults and children to discern between fiction and reality, good and evil, to choose and act rationally. It has attempted to exterminate personal critical thinking, initiative, objective decision-making and action. It causes paranoid and fanatical hate for advanced nations’ libertarian and prosperity symbols, ideas, institutions, and successful people, with thoughtless and automatic behavior, bordering on socially induced psychosis. The WHO’s International Classification of Diseases (ICD) ICD has not included these disorders yet. Oppression of the poorest masses, chaotically surviving in fear, disintegrates human health, blocks contention, induces tolerance to inequities and acceptance of self-banishment, either definitive to any nation or temporal collaborating in other nations. Cuba’s people have been erroneously considered of “high social resiliency and stability,” by observers who have had no access to this unreported tragic health situation. Cuba, instead of developing a holistic scientific medicine, has turned back from scientific medicine to pre-scientific holistic medicine. This cannot prevent or treat many health problems of a social or mental nature, and even physical ones, created by high psychosocial tension and stress, due to the massive regression to a pre-modern social rhythm in a nation with blocked channels for effective progress. This unnecessary sacrifice of the quality of health and life of millions of people has been caused by an anachronistic dictatorship seeking to maintain power in the face of a Soviet system that does not work. The 20th century demonstrated that even before food and shelter, human beings need open, full and free flow of information and communication to be able to achieve the satisfaction of their needs. Finally, the measurement of health could evolve toward a more health-centered and balanced system complementing the disease-centered one, transforming healthcare. Since the 17th century, population health has been monitored indirectly in relation with years of life and negative health indices, such as crude and adjusted demographic and morbidity-related indexes of acute and chronic infectious and non-infectious diseases.16 It seems that a great devotion to vital statistics and nosologies from John Graunt to William Cullen has stagnated the health classifications and indexes. In this third era of health of Lester Breslow,17 the health of patients and nations could be estimated numerically (scale 0–100) solving Paul Backer’s patient’s health equation, balancing positive health resources with strains.18 An integral health quantity could be a complement to estimations of duration of healthy periods and health quality. A new set of health status indexes could be correlated with estimations of quality of care, time and costs, to increase the efficiency of the healthcare systems. The evidence discussed in this paper supports the hypothesis that Cuba’s 1959–2010 fragmented, distorted and slow-changing health and education achievements are residual effects of high revolutionary violence exerted on levels of integral living standards and professional development achieved by pre-revolutionary Cuba. Rights to health and education for all were disconnected by political violence from other rights and decent living levels that were suppressed. Cuba’s oppressed, captive and impoverished masses have suffered—unlike their oppressors and wealthy leaders—a quasi-universal regression of living levels, greatest with regard to freedoms and income, but also significant with regard to integral health and education. In 1967–95 Cuba achieved universal access to healthcare and education, through physicians and teachers working with scarce resources and information, along with miserable food, housing, transport, and living standards. Leaders’ extreme political violence regarding most freedoms and living standards has led to psychosocial regression in Cuba, producing a chronic syndrome of terrified and quasi-psychotic masses, unable to detect the truth in official speeches and writings and to effectively rebel against oppression. While Cuba shifted from democraticcapitalism to totalitarian-socialism and in so doing fragmented its development, South Korea and other nations below Cuba’s HDI baseline in 1958 adopted democratic-capitalism and launched fast, sustained, and integral development. The biomedical-centric model in healthcare is challenged by a bio-economic psychosocial model. Efforts could be made to improve the measure of integral health quantity, duration and quality of patients and nations. 1. The author acknowledges the encouragement of Jorge L. Romeu, Richard A. Dickey, Thomas E. Norris, Kent Bream, Sherri Porcelain, Rachel Libby, Westley Phillips of the Universities of Wake Forest, Washington-Seattle, Pennsylvania, and Miami, as well as of María C. Werlau, Jorge Pérez-López and René Costales of ASCE. 2. WHO. Constitution of WHO. NY: WHO, 1946; WHO Health Level Measurement. WHO Tech Rep 1957;137:1–32. 3. Fuenzalida-Puelma HL, Scholle Connor S. The Right to Health in the Americas. Washington, DC: Pan American Health Organization, 1990; Sen A. Development as Freedom. 1st edn. NY: Alfred A. Knopf, Inc, 1999; Mann JM, Gruskin S, Grodin MA, Annas GJ. Health and Human Rights. NY: Routledge, 1999; Przeworski A, Alvarez ME, Cheibub JA, Limongi F. Democracy and development 1950–90. NY: Cambridge University Press, 2000; Gruskin S, Grodin M, Annas G, Marks S. Perspectives on Health and Human Rights. NY: Routledge, 2005; Gatti A, Boggio A. Health and Development: Toward a Matrix Approach. NY: Palgrave Macmillan, 2009. 4. 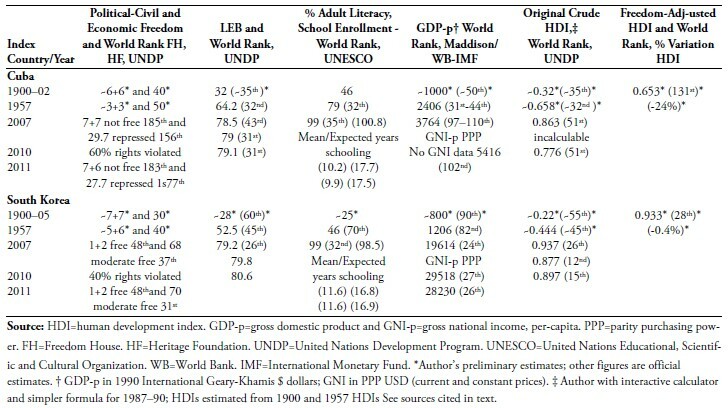 The UNDP social sub-indexes derived from the HDI truncating income are: “positive income per capita rank minus HDI rank” in 1997–2009, 2011 (first place in the whole world), and “non-income HDI value” in 2010–2011 (first place in the developing world). UNDP. Human Development Reports 1990–2011; UNDP. Human Development Report 2010. The Real Wealth of Nations: Pathways to Human Development. NY: UNDP, 2010; Klugman J, Rodríguez F, Choi H. The HDI 2010: New Controversies, Old Critiques. Human development research paper 2011/01. NY: UNDP Publ., 2011. 5. Susser M. Health as a human right: an epidemiologist’s perspective. Am J Public Health 1993,83(3):418–26; Figueras MA. [The Reality of the Impossible: Public Health in Cuba]. Habana: Ciencias Sociales, 1998; Bravo EM. Development Within Underdevelopment? Habana: Inst. Cub. Libro, 1998; MacDonald TH. A Developmental Analysis of Cuba’s Health Care System since 1959. Queenstown: Edwin Mellen Press, 1999; Yong Kim J. et al., eds., Dying for Growth. Monroe: Common Courage Press, 2000. 331–357; Sixto FE. An Evaluation of Four Decades of Cuban Healthcare. Cuba in Transition. Proc ASCE Conf 2002: 325–43; Spiegel JM, Yassi A. Lessons from the Margins of Globalization: Appreciating the Cuba Health Paradox. J Public Health Policy 2004;25(1) :96–121; Ranis G, Kosack S. Growth and Human Development in Cuba’s Transition. Coral Gables: UM ICAAS CTP, 2004; Torre E, Márquez M, Gutiérrez JA, López-Pardo C, Rojas-Ochoa F. [Health for All is Possible]. Habana: Soc. Admistración Salud, 2005; Cooper RS, Kennelly JF, Orduñez P. Health in Cuba. Int J Epidemiol 2006;35(4):817–24; Kath E. Social relations and the Cuban health miracle. New Brunswick: Transaction Press, 2010; Drain PK, Barry M. Global health. Fifty years of U.S. embargo. Science 2010;328(5978):572–3. 6. Nelson L. Cuba: The Measure of a Revolution. Minn.: University of Minnesota Press, 1972; Díaz-Briquets S. The Health Revolution in Cuba. Austin: University of Texas Press, 1983; Eberstadt N. The Poverty of Communism. New Brunswick: Transaction Books, 1988; Bureau of Inter-American Affairs. Zenith and Eclipse, 1998. McGuire JW, Frankel LB. Mortality Decline in Cuba, 1900–1959. Latin American Research Review 2005:40(2):83–116. 7. Davis C, Feshbach M. Rising infant mortality in the USSR in the 1970s. US Bureau of the Census, Series P-95;1980;74; articles of Eberstadt N. The health crisis in the USSR, Davis C. Commentary: the health crisis in the USSR: reflections on the Nicholas Eberstadt 1981 review were published in the Int J Epidemiol 2006;35(6):1384–94 and 1400–5; Aldereguía-Henriques J. [Salutology today] ,Universidad de la Habana, 1996; Castro F. The World Economic and Social Crisis: Report to the 7th Summit Conference of Non-aligned Countries. Havana: State Council, 1983. 8. Landes DS. The Wealth and Poverty of Nations. NY: W.W. Norton & Co, 1999; Moss M. Measurement of Economic and Social Performance. NY: Columbia University Press, 2003; Fogel RW. The Escape from Hunger and Premature Death, 1700–2100. NY: Cambridge University Press, 2004; Sachs JD. The End of Poverty. NY: Penguin Press, 2005; Easterly W. The White Man’s Burden. NY: Penguin Press, 2006; Clark G. A Farewell to Alms. Princeton: Princeton University Press, 2007; Maddison A. Contours of the World Economy, 1–2030 AD. Oxford: Oxford University Press, 2007; Romeu JL. “Statistical Thinking and Data Analysis: Enhancing Human Rights Work.” In J Asher, D Banks, F Scheurer eds. Statistical Methods for Human Rights. NY: Springer Publish Co., 2007; Betancourt RR. Human Rights and Economic Growth. Proc Cuba in Trans ASCE Conf 2007;(17):305–314; Libby RD. A Rights-Based Analysis of Reproductive Health in Cuba. UM Open Access Theses. Paper 345. 2011. 9. Stusser RJ. 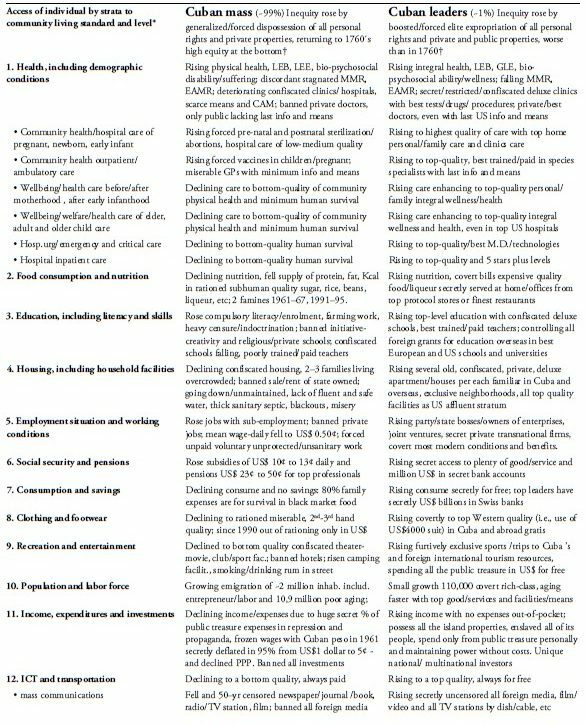 Progress on health care, research, education; 10 years scenarios. Digest of lectures given to US PTPI. Havana, 2002; Stusser RJ, Dickey RA, Norris TE. Enhancing global rural health with comprehensive and e-primary health and life care and research. Working Paper. Havana, Wake Forest, Washington Univ., 2007; Stusser RJ. Demystifying the Cuban health system: Insider´s view. Proc Cuba in Trans ASCE Conf 2011;(21):222–234. 10. Nelson L. Rural Cuba. Minn.: University of Minnesota Press, 1950; Ginsburg NS. Atlas of Economic Development. Chicago: University of Chicago Press, 1961; Stusser RJ. [Forecast of Cancer Prevention. Cuba 1985–2000]. Havana University Doctorate Thesis, 1987; Statistical Office. [Statistical Yearbooks of Cuba 1980–2010]. Havana, 1981–2011; UNICEF. State of the World’s Children Statistical Tables, 1990–2012; Statistical Office. [Life Expectancy. Cuba and Provinces 2005–2007]. Havana: Develop Studies, 2008; Henshaw SK, Singh S, Haas T. The Incidence of Abortion Worldwide. Inter Fam Plan Persp. 1999;25(Suppl):S30–S38; Loudon I. Death in Childbirth 1800–1950. NY: Oxford University Press, 1992; WHO. World Health Statistics 2010. Geneva: WHO Press, 2010. 11. UNESCO. Constitution of UNESCO. London: UNESCO, 1945; U.N. Universal Declaration of Human Rights, and Covenant on Economic, Social and Cultural Rights. NY: U.N. 1948, 1960; U.N. Report on International Definition and Measurement of Living Standards and Levels, and Interim Guide. NY: U.N. Publ., 1954, 1961. 12. Marks SP. Health and Human Rights. Cambridge: Francois-Xavier Bagnoud Ctr, 2006; Bollen KA. Political Rights and Political Liberties in Nations 1950 to 1984. Hum Rights Quar 1986;8:(Sp Iss):577; Brown CJ, Lago AM. The Politics of Psychiatry in Revolutionary Cuba. NY: Transaction Publishers, 1991; Donate M. [Living conditions in Cuba: psychosocial effects. Parts 1 & 2]. Proc Cuba in Trans ASCE Conf 1994;(4); Donate M. [Psychosocial costs of the Cuban revolution achievements]. Proc Cuba in Trans ASCE Conf 1995;(5):302–310; Biscet OE, Muñoz R. [Rivanol: A method to destroy life]. Havana: Lawton Foundation. Apr. 1998; The Danish Centre for Human Rights. Human Rights Indicators 2000. Copenhagen: Danish Ctr Human Rights, 2000; Mendoza D. [Dengue!. Fidel Castro’s Secret Epidemic]. Miami: Rodes Print., 2001; Bofill R. [Human Rights in Cuba]. Proc Cuba in Trans ASCE Conf 2002;(12):196–197; U.N. High Commissioner for Refugees. Statistical Yearbook Country Data Sheet -Cuba 2005; Hirschfeld K. ‘Sociolismo’ and the Underground Clinic. Proc Cuba in Trans ASCE Conf 2006;(16):335–350; U.N. High Commissioner for Human Rights. Report of Activities and Results 2009; Molina H. [My Truth: from the Cuban Revolution to Disenchantment]. Buenos Aires: Planeta, 2010; US Department of State, 2010 Country Reports on Human Rights Practices – Cuba, 2011; Freedom House. Freedom in the world, 2007, 2010, 2011; Heritage Foundation. Indexes of economic freedom. WCAS, 2007, 2010, 2011; Human Rights Watch. Annual News, Reports and World Reports on Cuba’s Rights Violations, 2011; Amnesty International. Annual Report 2011 The state of the world’s human rights. Human Rights in Republic of Cuba; Reporters without Borders. World Press Freedom (and Internet) Index and Information on Cuba, 2011. 14. The black boxes of Cuba’s healthcare, bio-pharmaceutical, and informatics industries still remain with censure, limiting the data accuracy. This has required a constant verification of the reliability of Cuba’s statistics, contrasting them with world sources and perceptions of the reality lived in Cuba. The author’s estimates will be adjusted as more data become available, when Cuban officials can report openly the statistics without fear of retaliation. Mesa-Lago C. Availability and Reliability of Statistics in Socialist Cuba. 1st and 2nd parts. Latin American Research Review 1969;4:1:53–91 and 4:2:47–81; Mesa-Lago C. Cuba in the Human Development Index in the 1990s. Proc Cuba in Trans ASCE Conf 2002;(12):450–463; Pérez-López J, Mesa-Lago C. Cuban GDP Statistics Under the Special Period. Proc Cuba in Trans ASCE Conf 2009;(19):153–167; Locay L. Cuban Socioeconomic Indicators before the Revolution. Proc Cuba in Trans ASCE Conf 2009;(19):146–152; and Ward M, Devereux J. The Road Not Taken: Pre-Revolutionary Cuban Living Standards. J Economic History 2012;72: (01):104–132. 15. Haggard S, Noland M. Famine in North Korea. NY: Columbia University Press, 2007; Kunzig R. Cities are the solution. They may be the best way to lift people from poverty. National Geographic Magazine 2011:220:6:124–47. 16. Stouman K, Falk IS. Health indices: a study of objective indices of health. Quart Bull Health Org L.O.N. 1936;5:901–1081; Swaroop S, Uemura K. Proportional mortality of 50 years and above. Bull WHO 1957;17(3):439–81; Logan R. Need to Evaluate Morbidity and Levels of Health. WHO Pub Health 1967:27; Stusser RJ. Multifactorial analysis of health areas’ mortality. Havana University Biostatistics Specialty Thesis, 1977; Adler NE, Boyce T, Chesney MA, Cohen S, Folkman S, Kahn RL, Syme SL. Socioeconomic status and health. Am Psychol 1994;49(1):15–24; Eriksson M, Lindström B. A salutogenic interpretation of the Ottawa Charter. Health Promot Int 2008 Jun;23(2):190–9; Commission on Social Determinants of Health. Final Report. Geneva: WHO, 2008. 17. Breslow L. Health Measurement in the Third Era of Health. Am J Public Health 2006;(961):17–19; Stusser R. Reflections on the Scientific Method in Medicine. Oxford: UNESCO EOLSS Publ, 2006. www.eolss.net; Stusser R, Albert M, Rodríguez A, et al. [Vedado project: e-health in primary health care]. Rev Cub Med Gen Int 2006;22(4); Stusser RJ, Rodríguez A. [The informatization of primary health care]. Rev Cub Med Gen Int 2006;22(4); Stusser RJ. Research challenges of primary health care medicine progress, 2012. (Essay under review in UNESCO EOLSS) 18. Hollnagel H, Malterud K. From risk factors to health resources. Med Health Care Philos 2000; 3(3):257–64; Malterud K, Hollnagel H. The magic influence of classification systems in clinical practice. Scand J Prim Health Care 1997;15(1):5–6. Rodolfo J. Stusser, M.D. has had a 42-year career as consultant, professor and researcher at the University of Havana. He was a pioneer in Cuba on primary health care general medicine research and on global health policy and system research. A former cardiovascular physiologist, general internist and practitioner, he specialized on clinical biostatistics/epidemiology, pioneering multi-factorial analysis of Cuba’s primary health care and the execution of the first Cuban clinical and population cancer and heart trials. He coordinated cancer research with East European COMECON nations, advised Nicaragua’s Ministry of Public Health on infant mortality reduction and scientific/technological programs during 1988-90 and taught in Managua Universities under a cooperation agreement with WHO and UNESCO. While in Cuba, he collaborated with professors at Wake Forest, Minnesota and Washington Universities. In 2006, he had to retire as MD, because from 19942009 the Cuban Ministry of Public Health denied exit permission for 33 invitations from U.S. universities/societies to lecture and collaborate.